My mother is a Michelin-star chef; in my head. All these years, she made me and my father, food that was quintessentially Bengali and that tasted just as good, for years together. My friends from school and uni, colleagues, girlfriends, cousins, wider family have sworn by her kitchen. About 90% Bengalis would want to copy that first statement of mine and paste it up as their ode to their mum’s cooking. Now you’d know that it would be difficult to please a Bengali with Bengali food. The Bengali New Year Menu at La Porte Des Indes was a short, one-week affair with head chef Vishal Rane preparing a set Bengali meal, on till 18 April. While the old ad-agency visualizer in me felt that the Bengali menu (with a typo) looked like a cyclo-styled insert in a newspaper, I told myself to wait for the food. And it did not disappoint me. 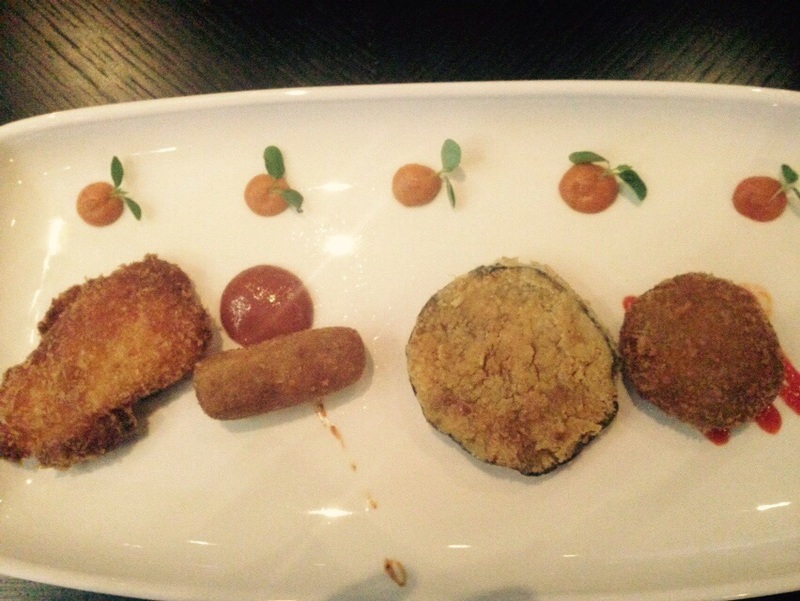 L to R: Fish Fry, Prawn Croquet, Brinjal Fry and Banana Flower Croquet. The story begins with a plate of mixed fritters, something any Bong would consume even on a weak stomach! I tucked into the fish fry Calcutta style; said a warm hello to the Chingri Chop or prawn croquet; paid my respect to the fried egg-plant or Begun Bhaja and was civil to the Mochar Chop (banana flower croquet). Also on the table was a chicken stir fry with green chillies that I found to be an illegal immigrant on the table. The main course appeared on the table in a jiffy. And then it was a concert on the plate! Flowery basmati rice with a hint of clarified butter (Ghee Bhaat) and Bengali gram dal with coconut (Chholar Dal) were definitely the couple of the evening. The lentil was cooked to perfection, with the right amount of sweetness and coconut slivers added to the taste. Certainly took me back to the streets of Bagbazar where my cousins and I would gobble down many a ‘kachauri’ or deep-fried fluffed Indian flatbread with ‘chholar dal’. The other memorable dishes were the home-style ‘Aloo Kopi’r Dalna’ and the rich ‘Kosha Mangsho’ or Indian mutton curry with velvety thick gravy. There was a chicken variety of the same for those that are not fond of mutton or lamb. They went best with the fluffy as Snowbell ‘Luchi’ or refined flour deep-fried flatbread. I shameless asked for 2 ‘Luchis’ more as I usually do at home. The other Bengali favourite was the ‘Chingri Machcher Malai Curry’ or prawns prepared in a coconut curry. I found the curry to be a tad high on salt that did not balance out the dish. While we gave the main course some time to settle down a bit, I managed to catch up with the chef who was posted in Kolkata for a brief bit. He elaborated on plans of doing an exhaustive Bengali menu for this year’s Durga Puja. Now that said, most would be putting down La Porte Des Indes as the ‘must-visit’ during pujas. 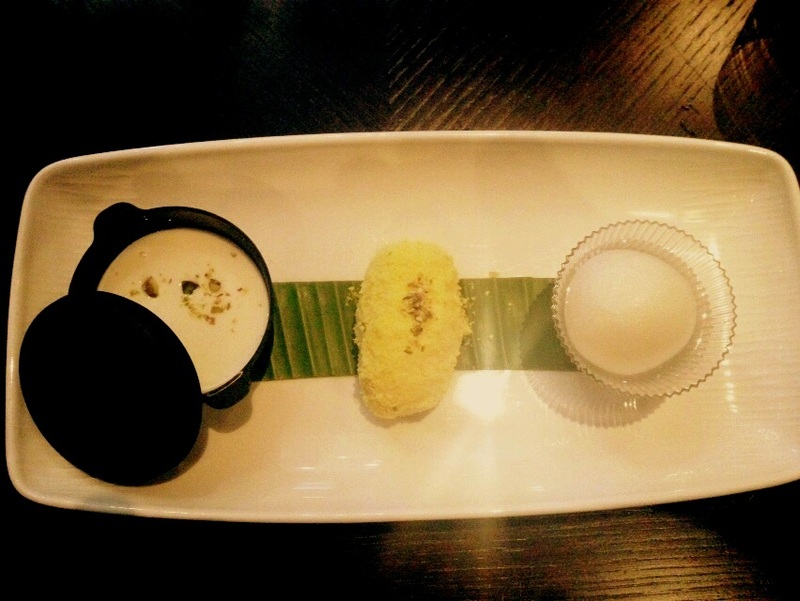 Dessert consisted of rabri, kheer chamcham and rasogolla. It would be a travesty to translate and foster a sense of taste through words; so I shall let it be. It would have been worthwhile, however, to have tasted the menu or wait for the next Bong outing this year around October. The Calcutta style fish fry! The Kheer Chamcham – makes you want to ask for more.